John Kenneth Muir's Reflections on Cult Movies and Classic TV: Ask JKM a Question #3: Nowhere Man (1995 - 1996)? “First of all, thank you for the thoughtful analysis and engaging writing you consistently provide on your blog. I’ve been following your blog for a couple years now and you have effectively changed the way I watch movies: I no longer passively watch them, but actively engage with them as I try to figure out the underlying themes communicated by the form and style. I’m excited about the new ‘Ask JKM a Question feature’ as I’ve had a question bouncing around in my head for a while. I was born in the eighties and so 90s television has great nostalgic value for me. Adam, I want to thank you for your comments about my blog and my writing. They really made my day. It’s always good to read that others are enjoying and appreciating one’s work. Regarding Nowhere Man (1995 – 1996), I remember that TV series fondly, though I have not seen an episode in over a decade. It starred the always-great Bruce Greenwood as photographer Thomas Veil, and Nowhere Man aired on UPN Monday nights at 9:00, right after Star Trek: Voyager during that program’s first season, if memory serves. Created and developed by Lawrence Hertzog, Nowhere Man ran for twenty-five hour long episodes and was a paranoiac’s dream. As I recall the set-up, Veil’s life was “erased” in the premiere episode (“Absolute Zero”) by a shadowy conspiracy because he publicly revealed a top-secret photograph called “Hidden Agenda.” Even Veil’s wife, Alyson, (played by Millennium’s Megan Gallagher) claimed not to know him. I remember, at the time, appreciating Nowhere Man’s oblique connections to another favorite paranoia trip, The Prisoner (1967). There, the prisoner, Number Six (Patrick McGoohan), was trapped in that bizarre European "village" for spies and ex-spies; but here Veil (as in lifting the veil...) found himself in an information age trap where the prison was the global village itself. Also, Nowhere Man featured some elements of “man on the run” programs such as The Fugitive, or perhaps more aptly, The Immortal (1970 – 1971). I also recall that the episodes were mostly very-well done and anxiety-provoking thanks to accomplished directors such as Tobe Hooper (“Turnabout,” “the Incredible Derek) and Thomas J. Wright (“Paradise on Your Doorstep,” The Spider Webb.”) I also seem to remember that the final episode (“Gemini”) resolved Thomas’s crisis in a completely surprising and unexpected fashion. 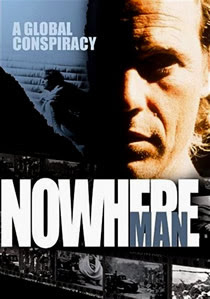 Roger Fulton and John Betancourt described Nowhere Man as “a passionate defense of the individual in the face of overwhelming odds,” (The Sci-Fi Channel Encyclopedia of TV Science Fiction; Warner Books, New York, 1997, page 304), and that astute observation squares with my memory. In terms of context, Nowhere Man arises out of that amazing time when network television kept attempting to ape the success of The X-Files (aliens + conspiracies + monsters). What remains so cool about this span in TV history is that many shows inspired by the success of Chris Carter’s X-Files were actually quite good in their own right, in part because they focused narrowly on just one element of the X-Files equation. I admired Dark Skies (1996), Prey (1998), Nowhere Man (1995) and Strange World (1999), and was intrigued by Sleepwalkers (1997). Probably the worst of the bunch was The Burning Zone (1997), the UPN “disease of the week” series that replaced Nowhere Man. The truth is, Adam, I’d love to watch Nowhere Man in its entirety again. I was not aware that the series had been released on DVD. Apparently I missed it, and the set came out in 2006. Now it is out of print. One way or another, I’ll get my hands on the series, and write up a cult-tv flashback about it. Because I haven’t seen the series in so many years, I don’t feel I can adequately or accurately answer your question about whether nostalgia is clouding your critical judgment. I really liked the series a great deal back in 1995. I also remember that the reviews were mostly very positive. So, if you’re suffering from nostalgia about the series, I’d say I’m likely infected with the same malady because all my memories are good. I hope I’ll get you a better answer soon. (I’ll start haunting E-Bay for the series on DVD…) because, frankly, I’d love to watch it from start to finish all over again. I own that series on DVD, bought it used and was really surprised it was stocked full of extras...for such a not-well-known TV series. I've yet to watch all the extras but I did watch it, and I also watched the show on its original run here in Iceland. 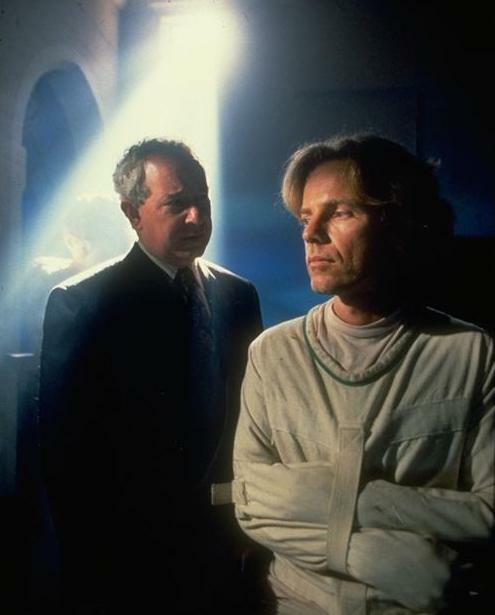 There was a lot to like, Bruce Greenwood, Mark Snow's theme song and the paranoia. It's so funny, the creator of Nowhere Man, wanted it to have no specific arc but the network demanded an arc. And for once I agree it with the network people, but as a whole the series is disjointed and some don't age well. But there's still a lot to enjoy about them, a couple good episodes and some good guest actors. I remember Richard Kind in one of the early ones. I'm not sure I saw all the episodes as I was so sure I had seen the last episode, the last shot...but it was at least one or two episodes off. So, I really didn't know the ending when I watched the DVDs. I can't say I liked the conclusion but it had really nowhere else to go to, from the start it really felt like a single season show...how long can they keep this up? I hope you can find it cheap as I would love to read your thoughts on it, as I do on about almost everything you write on your blog. Great memories of Nowhere Man. The last episode sent me into a tailspin when I saw it, if I remember it all right. I knew there was going to be twist...but THIS was a twist, right? I'd love to see the show again, and write about it in more detail here. I wonder if would be possible to read script of season 2 and others , even if they were not done .